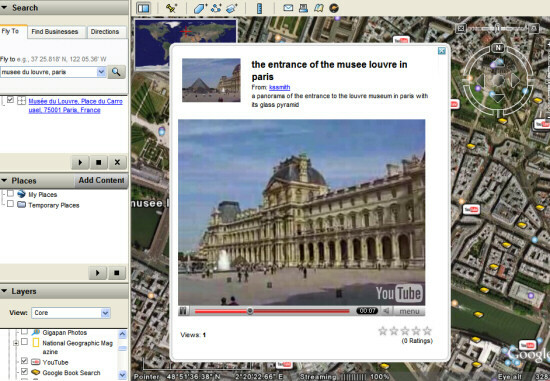 The latest version of Google Earth (namely 4.2) added support for Flash content in placemark balloons. Probably the most popular usage of Flash in the last 2 years is for displaying videos online, an idea that made YouTube a hit. Now that YouTube offers an option to enter the location of a video when you upload it, the connection between YouTube and Google Earth becomes clearer. Google Earth added a layer that displays YouTube videos related to the current location. Videos bring a place to life and capture the atmosphere that makes it unique. You'll also find many stories from people that live there. A similar layer is available in Google Maps as a mapplet, but unfortunately these are the only two ways to view geotagged YouTube videos. YouTube doesn't provide an option for restricting search results to a certain area or for viewing the location of a video. Connecting content with geographical information is still a difficult problem because, in many cases, users have to manually enter the location. For its books index, Google automatically identified the places mentioned in the text and exposed this information in a Google Earth layer, but the data is imprecise. In Picasa Web Albums, you can enter the location or select it using Google Maps, but Google had to buy a community site centered on mapping photos to add high-quality photos to Google Earth. Thank you, I fixed my silly error. unfortunatly, such videos are not always relevant ! for better quality, you may prefer to use http://www.turnhere.com or http://www.VeniVidiWiki.eu where videos are selected regarding quality and pertinence criteria ? Esti din Romania...nice :) Te-am adaugat la Blogroll.